Los Angeles will soon be home to the first American outpost of the London-based Hospital Club, a private social club aimed at arts-focused creative professionals. The new venture, designed by HKS architects, would establish a hotspot for artists and creative entrepreneurs in Los Angeles’s Hollywood neighborhood by taking over the existing Redbury Hotel at the intersection of Hollywood Boulevard and Vine Street. 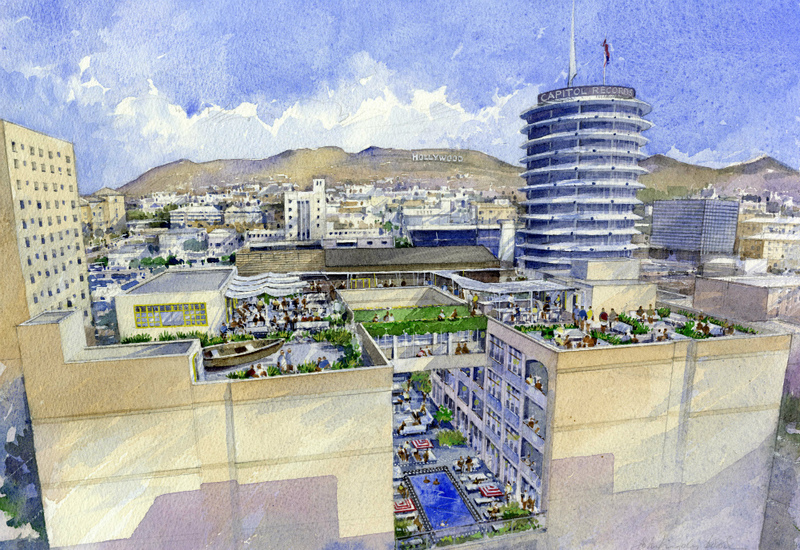 That building, located across from the historic Capitol Records building, will be renovated to contain a slew of performance and shared office and studio spaces, as well as hotel rooms. The new complex, dubbed h. Club LA, will house facilities for film screenings, musical performances, exhibitions, among other types of cultural programs. It will also provide up to 36 bedrooms for use by the public. Hotel guests will become temporary members during their stay and will have access to the member facilities. The club will also offer a slate of member-accessible amenities, like a rooftop patio and restaurant, co-working spaces, gym, and music studio. The club, which offers half-price memberships to individuals who are under the age of 30, is scheduled to open in 2018.